Last update issued on October 6, 2003 at 03:45 UTC. The geomagnetic field was very quiet to active on October 5. Solar wind speed ranged between 333 and 503 km/sec. A high speed stream from coronal hole CH61 arrived at ACE at approximately 16h UTC. The interplanetary magnetic field was moderately to strongly southwards at times between 19 and 21h UTC. Since then the IMF has been mostly northwards resulting in a significant decrease in the geomagnetic disturbance level. Solar flux measured at 20h UTC on 2.8 GHz was 109.6. The planetary A index was 9 (STAR Ap - based on the mean of three hour interval ap indices: 10.4). Three hour interval K indices: 221223334 (planetary), 11012134 (Boulder). At midnight there were 3 spotted regions on the visible disk. Solar flare activity was low. A total of 6 C class events was recorded during the day. Optically uncorrelated flares: C2.6 at 09:20 and C1.0 at 11:06 UTC. Region 10471 decayed in the leader spots while slow development was observed in the trailing spots. There is still a magnetic delta structure in a central penumbra. Flares: C1.0 at 00:37, C1.5 at 01:39 and C4.2 at 13:28 UTC. Region 10473 developed some small trailing spots, all in the same (negative) polarity as the dominant spot. 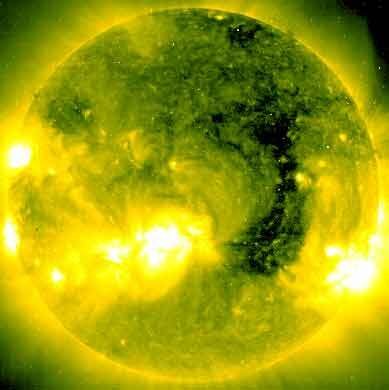 Flare: C1.2 at 03:12 UTC. New region 10475 emerged in the southeast quadrant on October 4 an d was numbered by SEC the next day. 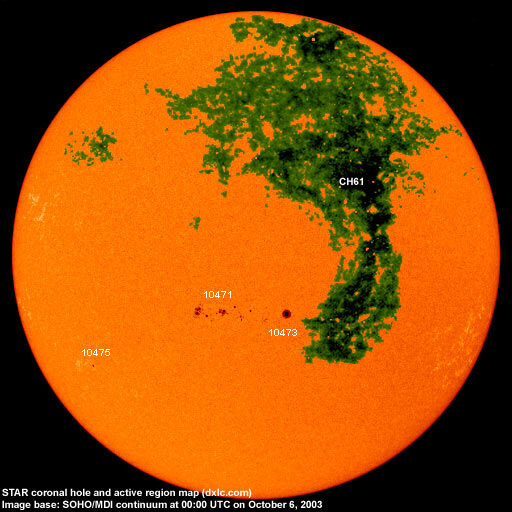 October 3-5: No potentially geoeffective CMEs observed. A coronal hole (CH61) in the northern hemisphere and with a trans equatorial extension was in a geoeffective position on October 3-4. Processed SOHO/EIT 284 image at 19:06 UTC on October 5. The darkest areas on the solar disk are likely coronal holes. 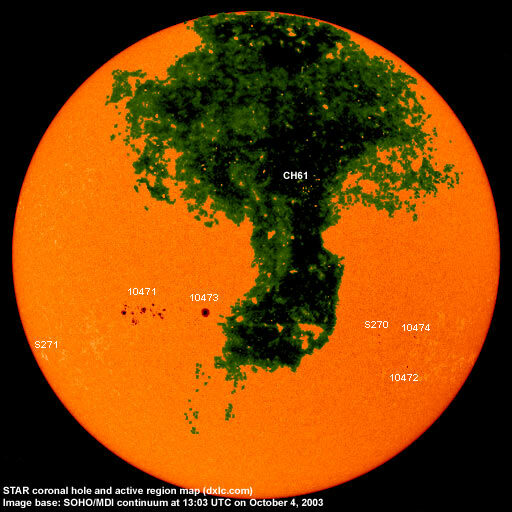 The geomagnetic field is expected to be quiet to active October 6-7 due to a high speed stream from coronal hole CH61. Quiet to unsettled is likely on October 8-10. Long distance low frequency (below 2 MHz) propagation along east-west paths over high and upper middle latitudes is very poor. Propagation along north-south paths is poor. [Trans Atlantic propagation conditions are currently monitored every night on 1470 kHz. Dominant station tonight: Cadena Peruana de Noticias].